It’s interesting to note that Bob Marley played this song using his thumb, not a plectrum. I explain this in the lesson. You can use a plectrum if you want, but I would suggest using just your thumb here, the sound you get by playing like this sets the mood of the song. We’ll start our guitar lesson on Redemption Song by learning to play the intro. 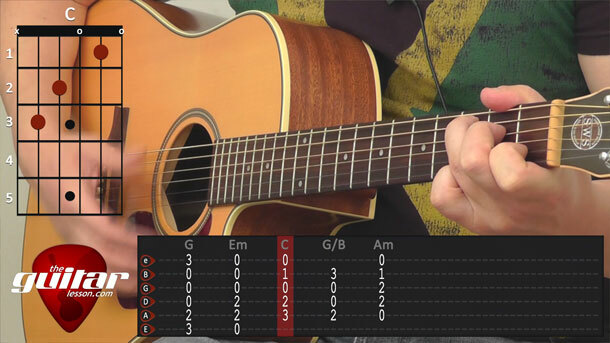 It is super simple, just a few notes on the G major scale, perfectly suitable even if you started playing guitar today. We’ll also learn a hammer-on version of the intro, which you can progress to once you know the basic melody. Next, we’ll learn the chords to Redemption song. Again, they’re nice and simple open chords. The only one you might have a bit of trouble with at first is the G/B. Practice changing into it with minimal finger movement, and you’ll get it soon. Once you know the chords, I’ll show you the strumming pattern I use while playing Redemption Song. You can use a plectrum if you like, but again, if you want to make it sound authentic, which in this case, is gloomy and sorrowful, you should use down strums with your thumb aiming for the base strings more than the treble strings. You can really hear the difference, I’ll show you in the tutorial. After the verse, we’ll also learn the chorus, which is just slightly different from the verse. You’ll be able to learn it very quickly. Keep in mind that the actual song is always played differently. It is a solo acoustic piece, so you can play it however you want, as long as you keep to the structure of the song. If you’re more advanced, try using different voicings of the basic chords to give yourself a challenge. Redemption Song was recorded by Bob Marley and released in 1980 on his album Uprising. It is one of his greatest, and most famous songs. Not many people know that Bob Marley was diagnosed with cancer in his toe at around the time he was writing this song, which also adds to the general mood of the song (and the album). This cancer was the cause of Marley’s early death. The lines "Emancipate yourself from mental slavery" and "None but ourselves can free our minds" were taken from a speech given by Marcus Garvey in 1937. Sorry, but you've reached a premium content area. The download of the Redemption Song tablature file is only available to premium members. Sorry, the same goes for the backing track. To download the backing track to Redemption Song, please log in and revisit this page.